The app economy will double by 2020 and reach astonishing $101 billion in global revenue. Good news, right? People are eager to spend more money on great mobile products. Yet, monetizing an app still seems to be an attainable goal for a lot of product owners. Tristan Louis has calculated back in 2013 that the average revenue per app download is just $0.18 for Android apps and $.1 for iOS. Now you are wondering - how can I tap into the $101 billion revenue stream, instead of settling for those pennies? It all starts with developing a mobile app monetization plan before you build that app or when it is still in the early stage of wireframes. In fact, failing to choose the right monetization model is one of the key reasons why entrepreneurs call it quits and abandon the mobile app market. Before you start thinking dollars, you need to make sure that your product is worth paying for. This quick checklist below accounts for the most common app development pitfalls and helps you avoid those. You should tick all of the points before you start monetizing your app. 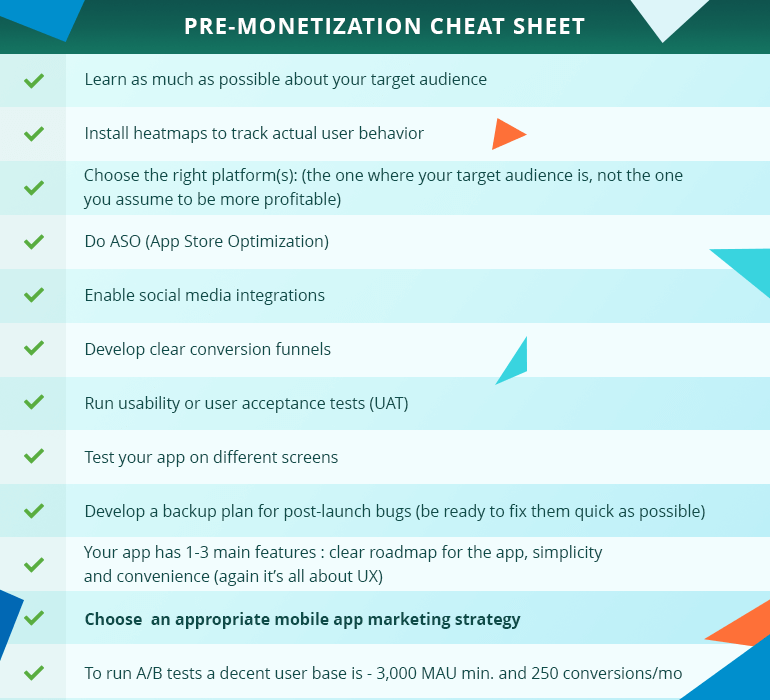 To find the perfect app monetization model you will need to establish your product goals first and align those with your target audience’s preferences and needs. For instance, games were among the top grossing apps for the past five years according to AppAnnie and 98% of them are free to download. With gaming - it’s simple. Most users are interested in all sorts of in-app purchases.But what about other niches? Should you offer your app for free or ask to pay for it? How do you entice users to pay? 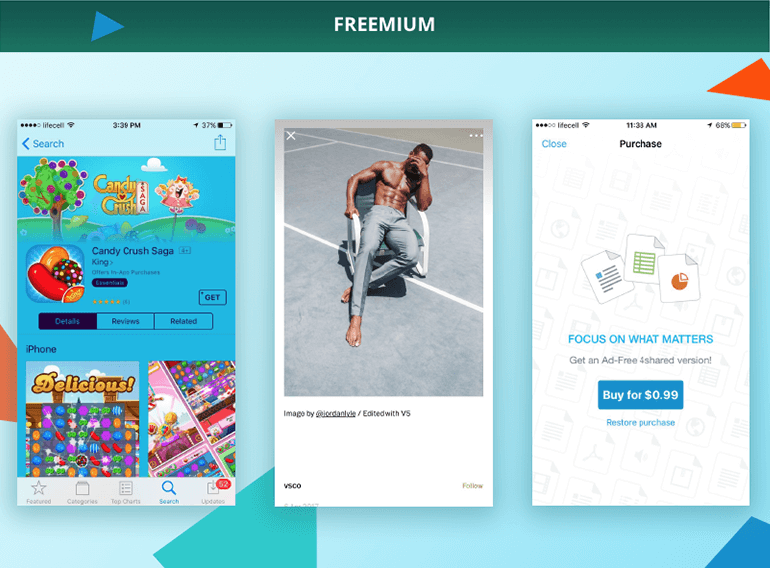 Considering that “free” is now the norm, we’ve looked into various in-app monetization strategies worth using. There’s no lack of ad networks today for mobile apps. Yet, each of them has some drawbacks - low payouts, irrelevant ads, annoying terms and so on. The good thing is that you can combine different ad networks to achieve higher ad performance. If you have enough sales and ad operations expertise, you can implement an ad server and compete networks, like Mopub, Appnext, Admob etc. Most savvy in-app companies implement a Google owned ad server called DoubleClick for Publishers (DFP) which is the most popular ad server in the world. It has a unique integration with the best performing ad network called DoubleClick Ad Exchange (AdX). It is the premium version of AdMob but requires either a direct account with Google or to work with a third party company. If you don’t already have a dedicated Google rep, you’ll have to work with a third party. Rather effective if you opt for native ads and targeted advertising. Users engage with native ads 20% to 60% more often compared to banner ads. Mobile advertising spending will surpass desktop by 50% in 2018. Easy-to-implement for app developers as you only need to insert SDK code into the application. People can get annoyed with ads, which may lead to app churn. Opt for native and non-intrusive ads to avoid that. Mobile ads can hamper in-app experience by claiming a good chunk of screen space. This monetization model does not work well for niche apps that are designed to help users perform important functions (e.g. hail a cab). You offer users access to some basic functionality, but charge them for premium or proprietary features. According to App Store’s top 200 grossing chart, Minecraft (priced $6.99), Grindr (priced $0.99), and Facetune (priced $3.99) were the only paid apps for the first quarter 2017. All the others use the freemium model, generating their revenue by selling items within the app. games, educational apps,and products offering advanced functionality, any app that involves progress (has multiple levels). Easy to implement if your app has advanced levels or features already built in. “Try before you buy” has proven to be a good business model. The total cost of ownership for the app is unclear at the start. 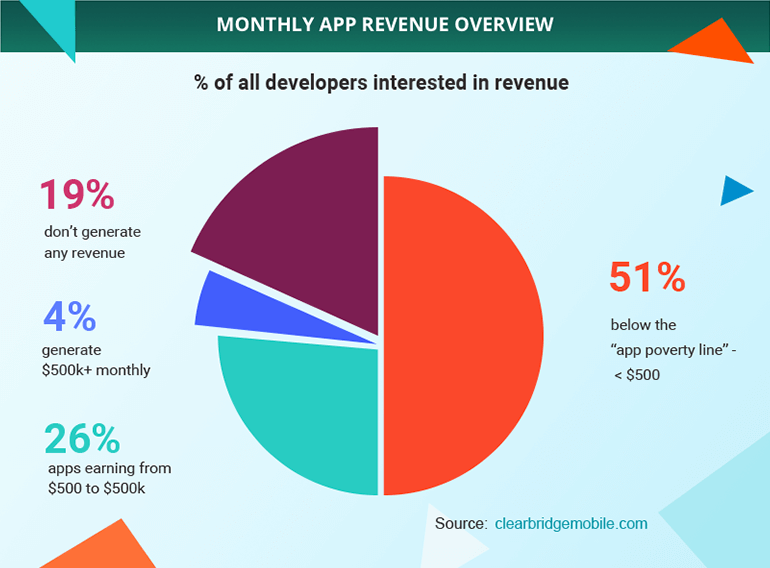 Only 0.5-2% users will pay for your app. 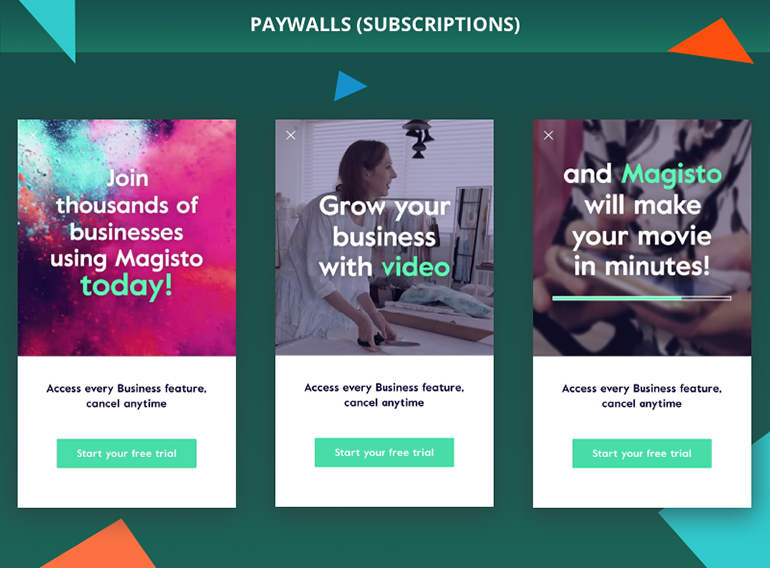 If the free features aren’t captivating, you won’t entice users to pay. 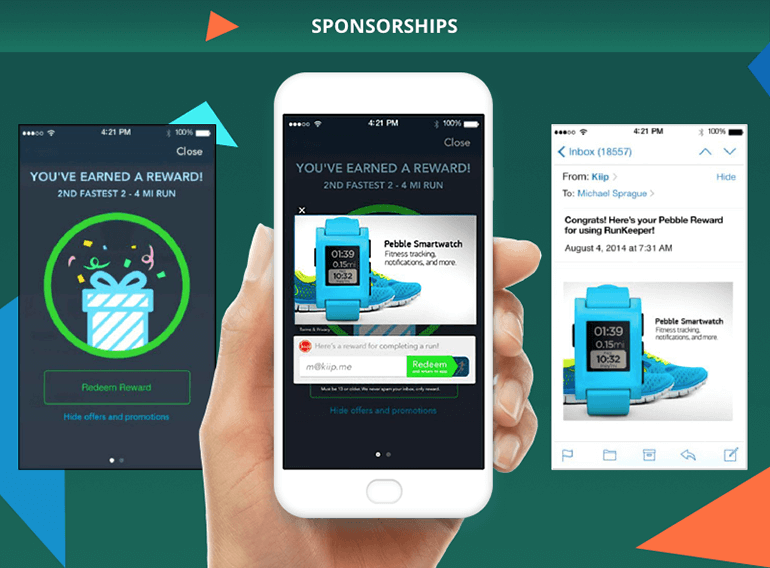 Sponsorship entails partnering with advertisers, who will provide rewards to your users when they complete certain in-app actions. This model assumes that your audience is big enough to attract brands to pay for exposure. travel apps, dating apps, event apps. User engagement can be high since the content is relevant and/or valuable. Сhallenging to find partners, whose customer base aligns with yours. Fixed-priced revenue based on the original sponsorship agreement. You don’t earn more if the campaign performs better than expected. This monetization strategy is self-explanatory. 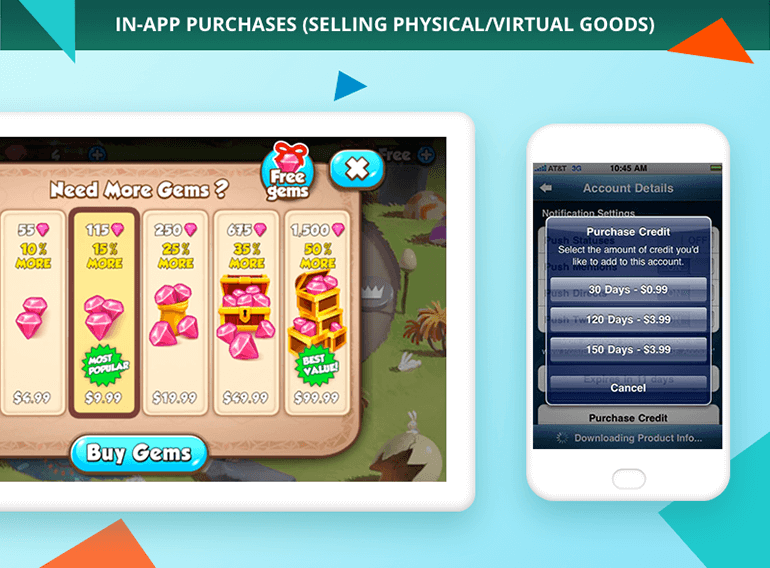 It assumes selling physical or virtual goods within your app, and then retaining the profits. That could be anything from rare collectibles to custom stickers and so on. Low risk/high profit, especially with digital or virtual goods. Flexible enough to support affiliate and partnership programs. You will need to incorporate a mechanism to prevent accidental in-app purchases. At its core, this model is similar to “freemium” model as users get to test drive the app first, but then need to sign up for a subscription to bypass certain content limits and restrictions. entertainment, lifestyle, music, and news-type apps. Lower churn due to engaged users. Regular, ongoing revenue stream thanks to auto renewals. Curating and/or creating the type of high-quality content your users will want to pay for is challenging. The good news is that you can blend all the strategies mentioned above to match your business model. The free version of your app, for example, can include in-app advertising that goes away once a user has upgraded to premium version or subscribed for premium content. 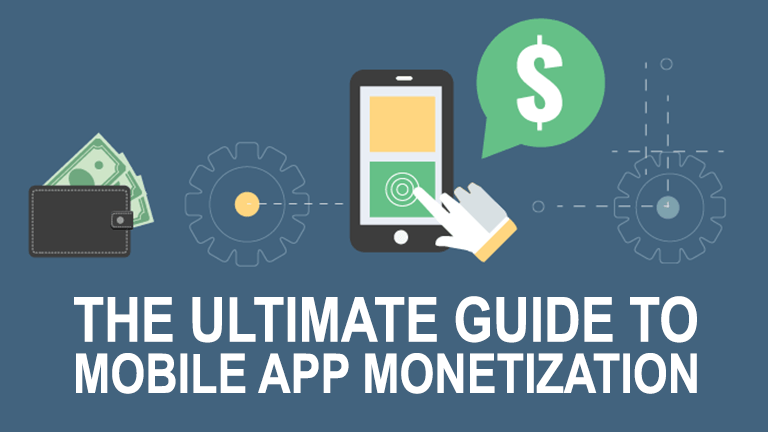 Paid apps can offer in-app purchases to enhance monetization. And partnership arrangements can be integrated whenever a suitable advertiser comes knocking on your virtual door. ​The importance of mobile measurement and attribution will rise further. Here you can find the essential list of the most important metrics to track.Hint: start with App Usage (MAU and DAU), LTV, and churn rate. ​Mobile programmatic media buying helps you automate and optimize themobile media buying process in real-time. Meaning you can serve more relevant ads to the users. 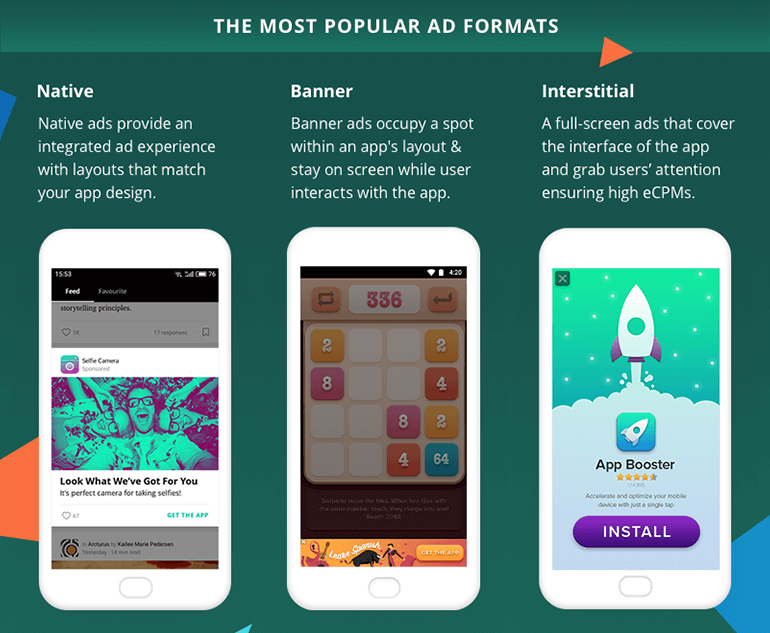 Keep your app updated, use native ad formats and work with trusted advertisers. Consider Snapchat, Messengers, IOS search ads as new traffic sources. Previous Post Review of the 5 Best African Affiliate Networks Next Post Why sign up to SiteGround?